At Thomas College, on the 24th of October, the Tigers faced off with the Winthrop Ramblers, in a regional final game. The Tigers were very upset with a 3-0 loss, ending their season. With a majority underclassmen team, the Tigers had a hard match up with the Winthrop Ramblers. Dexter was held to one shot all game. Winthrop captain, Katie Perkins, scored the first goal off a penalty corner halfway through the first half. With a little under five minutes left in the first half, Freshman Maddie Perkins gave Winthrop a 2-0 lead. Maddie Perkins closed out the second half with another goal, bringing the Ramblers to their 3-0 win over Dexter. The Tigers are done with their season after this game. ​In Dexter, on Saturday, October 20th, the Tigers faced off against the Mount View Mustangs, who held the Tigers scoreless the previous two games. The Tigers defeated the Mustangs 2-1, leading them to a regional final game. Brianna Trip gave Mount View their single goal. Kassandra Gray scored the Tigers first goal with just over 5 minutes left in the first half, evening the score out at 1-1. Kassandra Gray with an assist to Kiana Bennett to get the second goal putting the Tigers up 2-1. The Tigers play on Wednesday, the 24th of October at Thomas College, in their regional final games vs Winthrop. ​On Tuesday, October 16th, the Dexter Tigers Quarter-Final game, at home against Stearns resulted in an advance for the Tigers, who won 2-1 with double overtime and overtime corners. Kiana Bennett and Kassandra Gray had the two goals for Dexter, Cheyenne Beem had the assist for both goals. Between Amanda Haskell and Shawnee McNally, in goal, there were 5 saves on 9 shots. For Stearns, Katie Farber had the single goal, Lexi Stevens in goal, had 3 saves on 13 shots. The Tigers play Mount View, Saturday the 20th, at 11am, in Dexter. The Dexter Tigers field hockey finished the regular season with a 3-0 win over Stearns on Tuesday afternoon at Dexter. Alivia Anderson, Kiana Bennett, and Kassandra Gray each scored one goal for the Tigers. Dexter (10-4) enter the class C playoffs winning nine of their last 10 after starting the season 1-3. Dexter will open the class C tournament with a quarterfinal game against Stearns or Boothbay on October 16th. Stearns finishes the regular season with a 4-8-2. Tory Asbury scored two goals to lead the Dexter Tigers field hockey team to a 2-0 win over Central on Monday afternoon at Dexter. Dexter (9-4) will finish their regular season with a home game against Stearns on Tuesday at 3:30 PM. The Dexter Tigers will travel to the undefeated Foxcroft Ponies. The Dexter Tigers beat the Ponies 2-1 in overtime. The Ponies have never gave up a goal this season, they’ve out scored their opponents 64-0 going into the game against the Tigers. Tory Asbury gave the Tigers the victory when she put in the game winner in overtime. Kiana Bennett also scored for the Tigers on assist from Asbury. Sheryl Chase scored the goal for the Ponies. The Dexter tigers will host the Mattanawcook Lynx in their homecoming game on Friday afternoon. ​On October 5th, in the Dexter Tigers homecoming game, they face off with Mattanawcook Academy at Dexter. The Tigers came out on top, winning with a score of 2-0. For the Tigers, Aliviah Anderson and Autumn Irwin both had one goal each. Goalies Amanda Haskell and Shawnee McNally combined for 0 saves on 1 shot. The Mattanawcook Academy goalie, Gabbie Theriault had 8 saves on 17 shots. The Tigers next game will be October 8th, at Dexter. On October 3rd, at Mount View, the Mustangs defeated the Tigers 3-0. Dexter goalies, Amanda Haskell combined with Shawnee McNally for 15 saves on 17 shots. All unassisted goals, Devon Burgess, Sophia King, and Maddy Knowlton each had 1 goal resulting in the Mustangs 3-0 win. Mount View goalie, Thurston Illingworth had 2 saves on 3 shots. The Tigers play the Foxcroft Ponies, tomorrow October 4th at Dover. At Dexter, on the 28th of September, the Tigers won 1-0 against the Orono Red Riots. Early in the first half, Tina Lawson set up Rayna Bernard for the only goal of the game. Shawnee McNally had 5 saves in goal, this including 2 in the final minutes. Orono put up 5 shots on goal in the final 30 minutes of the second half, none resulting in a goal. The Tigers will face off with the Mount View Mustangs on the third of October. On Thursday, September 27th, in Lincoln, the Dexter Tigers won 4-0 against the Lincoln Lynx. Tory Asbury and Aliviah Anderson each had one goal in the first half. In the second half, Rayna Bernard and Kassandra Gray each had a goal carrying the Tigers to their fourth straight win. The Tigers are hoping for a fifth straight win against Orono on the 28th of September. On Wednesday, September 19th, the Tigers faced off with the Orono Red Riots in Orono, for the first time this season. The Tigers won 3-1. Tory Asbury with the first 2 goals in the first half, Rayna Bernard added a goal leading the Tigers to a 3-1 win over the Red Riots. This was Dexter’s third straight win leaving them with the record of 4-3. Julianna Morrison was the only scorer for the Red Riots. Orono now has a record of 3-3. On September 27th, they face off with Mattanawcook at Lincoln. At Dexter, the 17th of September, the Tigers defeated the PCHS Pirates 2-0, after an upsetting 1-0 loss earlier in the season at Guilford. Tory Asbury had a goal in the first half, Cheyenne Beem finished off with a second half goal bringing the Tigers to their 2-0 win. The Tigers will play at Orono on the 19th of September. The 14th of September, the Tigers traveled to Corinth for their game vs Central Red Devils. The Tigers won 2-0 over the Red Devils. Cheyenne Beem and Kiana Bennett each scored one goal to power the Tigers over the Red Devils, ending the Tigers 3 game losing streak. The Tigers are now 2-3. On September 17th, the Tigers will face off with PCHS for the second time this season at home. ​On Thursday, the 13th of September, the Foxcroft Academy Ponies traveled to Dexter to head off at 4pm. It was a tough loss against a Class B team, 5-0. Between the two goalies for Dexter, Amanda Haskell and Shawnee McNally, they had 8 saves on 17 shots. For the Ponies, Ava Rayfield had 3 goals, Jemyni True and Cassidy Marsh each with one. Abbie Moore, had 0 saves on 0 shots. Tomorrow the Tigers face off with the Central Red Devils at Central. 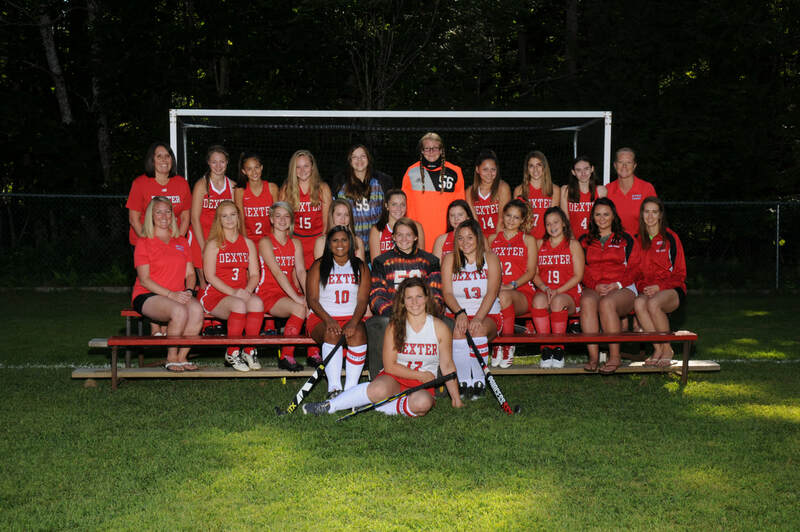 ​At Dexter on Saturday, September 8th, the Mustangs of Mount View held off Dexter with a 2-0 win in Field Hockey. Previous to this game the Mustangs were 0-3. Sophia King, of the Mustangs, scored the first goal in the first half with a little over 17 minutes left. King also took a pass from Maddie Knowlton with 9:14 left in the first half to score before the half ended. The second half the Mustangs were strong in their defense, and kept the Tigers back. Dexter had two corners but couldn’t convert. The Tigers face off with the Central Red Devils next, on September 11th. At Guilford, on September 4th, the Tigers were upset with a 1-0 loss to the Pirates. The Pirates early in the season have a 2-0 record. Chelsea Cookson scored the only goal for the Pirates, with an assist from Ariona Gerry. The Pirates goalie Louise Gerickont had 4 saves. The Tigers have a 1-1 record. Amanda Haskell, the Tigers goalie had 5 saves. The Tigers play the Mount View Mustangs at home on September 8th. At Millinocket, on August 31st, the Tigers scored two goals. The Tigers won over the Minutemen 2-1 in overtime. Cheyenne Beem scored the first goal putting them up 1-0. Alyviah Anderson then scored a goal in overtime carrying the Tigers to a win. Katie Farber then scored a goal for Millinocket with Elaina Bradford with an assist. On September 4th, the Tigers will travel to Guilford to play the PCHS Pirates.